On Friday at lunchtime, after weeks of speculation, the White House confirmed that Bannon was out. “White House Chief of Staff John Kelly and Steve Bannon have mutually agreed today would be Steve’s last day,” a statement from the press office said. “We are grateful for his service and wish him the best.” With that, the rumpled controversialist who took over Trump’s Presidential campaign last August—Trump was right that he came on late—and subsequently became the chief political strategist in the White House joined Michael Flynn, Sean Spicer, Reince Priebus, and Anthony Scaramucci on the list of senior Trump aides to get the chop. There may well be more departures to come. Working for Trump is like entering the haunted house at a fairground: you never know when the trapdoor below your feet is going to open up. By lasting about a year in Trumpland, Bannon actually did pretty well. As a self-styled conservative revolutionary who had long seen his primary mission as blowing up the donor-dominated Republican Party, he was always going to be an awkward fit in a Republican White House. And when, during the first days of the Administration, his pasty mug appeared on the front of Time magazine next to the headline “The Great Manipulator,” he breached the first rule of the Trump world: never overshadow the boss. Despite that faux pas, Bannon lasted for another six and a half months. However, he was never quite the Svengali character that the media portrayed him as. In a White House that quickly divided into rival camps that battled internally and sniped at each other publicly via leaks to reporters, he had to contend with mainstream Republicans like Priebus and Vice-President Mike Pence; Wall Street pragmatists like Gary Cohn, the head of the National Economic Council; members of the military and foreign-policy establishment, such as H. R. McMaster, who replaced Flynn as the national-security adviser; and Trump family members, particularly Jared Kushner, the President’s son-in-law. It’s been widely reported that many of these people had been seeking Bannon’s ouster for months. For as long as he lasted, Bannon fought his corner and sought to convert some of Trump’s campaign promises into actual policy measures. 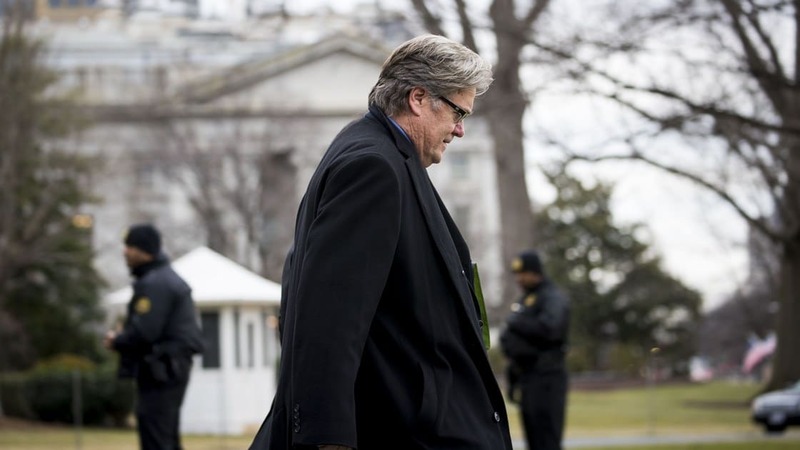 As someone who had long proclaimed that the America of his childhood was under grave threat from multiculturalism and what he referred to as “Islamic fascism,” Bannon was perfectly comfortable with Trump’s strident embrace of nativism and revanchism; indeed, he had promoted this same approach during his tenure as the chief executive of Breitbart News. In the early days of the Administration, he worked hard to get some of Trump’s more incendiary proposals enacted, including his crackdown on undocumented immigrants and his ban on Muslims entering the United States. But to hold Bannon responsible for Trump’s most offensive gestures and utterances—including the President’s refusal, this week, to distance himself from white nationalists and neo-Nazis—would be going too far. At his Trump Tower press conference, Trump said that he hadn’t even talked to Bannon about what happened in Charlottesville. His equating of the “Unite the Right” marchers with the counter-protesters; his claim that there were some “really fine people” on both sides; the comparison he drew between the Founding Fathers and the leaders of the Confederacy—these were all Trump’s own handiwork. Far from being a ventriloquist’s dummy, Trump is a headstrong lone operator, and he strenuously resists any efforts to constrain or direct him. For a time, Bannon was useful to him because he had the instincts of a political brawler and the ability to covert rabble-rousing rhetoric into something that could be presented to the gullible as a semi-coherent political philosophy. But now that Bannon has departed, there is absolutely no reason to suppose that the President will change his ways. Trump is Trump is Trump. That is how it has always been. That is how it always will be. In some areas, particularly foreign policy, the White House may even have lost a restraining voice. A skeptic of U.S. interventionism, Bannon opposed the Pentagon’s missile strike on Syria, and he was highly dubious about the United States confronting North Korea. “There’s no military solution, forget it,’’ he told Bob Kuttner, of The American Prospect, a few days ago. A former Goldman banker himself, Bannon had also recently pushed for higher marginal tax rates on the rich—as high as forty-four per cent for those earning more than five million dollars a year. Although such a policy would probably prove popular among Trump’s core supporters, the prospect of Cohn and Treasury Secretary Steven Mnuchin incorporating it into the tax-reform package that they are working on always seemed like a long shot. Without Bannon there, a populist turn seems even less likely. If Trump is hoping that Bannon’s departure will ease the political pressure on him, he is certain to be disappointed. Three months ago, it might have had some impact, but today the focus is firmly on the President himself, and whether he can repair any of the enormous damage that he has done to himself, and to the country, with his loathsome response to the tragic events in Charlottesville. 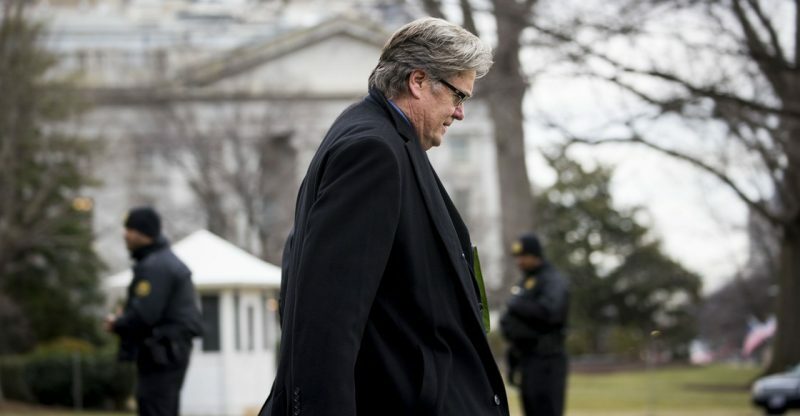 Set beside this ongoing political earthquake, Bannon’s exit seemed almost like a gossip item. The spin was that it all the work of Kelly, who took up his post less than three weeks ago. “This was without question one man’s decision: Kelly. One hundred percent,” an anonymous senior White House official told the Washington Post. For a moment, let us go along with the fiction that Kelly, who is ultimately another functionary, could force out Bannon without Trump’s approval. Then the argument could be made (and Trump’s surrogates are busy making it) that Kelly is steadily purging the most ineffectual and incendiary elements from the White House, and that things are finally getting on track. But what, pray, can Kelly do about the real problem: the character of the man in the Oval Office? Very little.